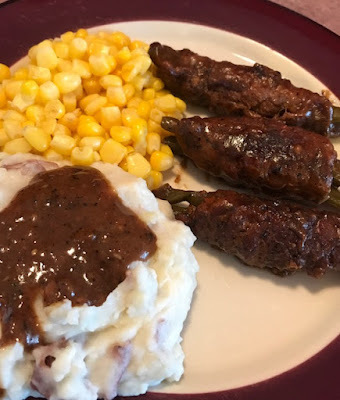 Leftovers don't have to be boring. All you need is a little creativity, a bit of a foodie gene within your bones, and you're good to go. 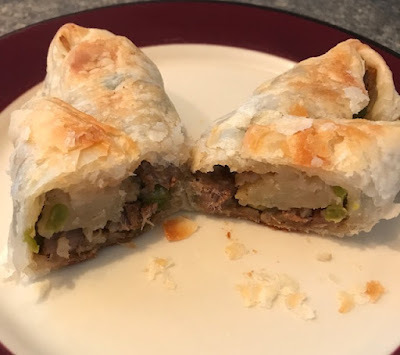 Today while my wife was out I had the opportunity to surprise her with another foodie creation, but this one was made up almost entirely of refrigerator leftovers. It was a huge hit, as proved by how much we both ate; clearly more than we probably should have. Yum. So here's how it all began. 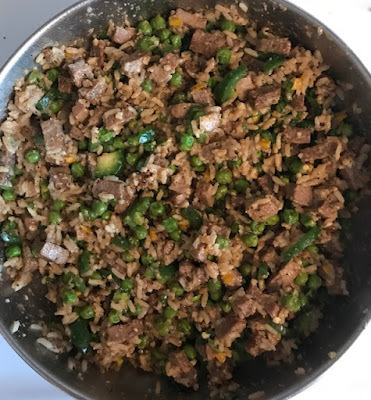 Into a fry pan I dumped my leftovers: rice, peas, steak (cut into small cubes), raw onion and yellow pepper. To this I added a couple jalapeño peppers, some HP Bold Steak Sauce, garlic powder, black pepper, and a little salt. I stirred this over medium heat until everything was well blended and heated through. As always, I used up several spoons along the way sampling the concoction. I remember thinking that this by itself would have already made a decent casserole. But that was not to be this time; I had other plans. 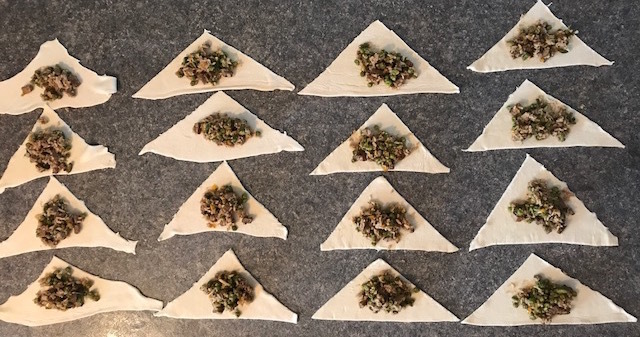 Frozen puff pastry dough was thawed and cut into rough triangles. 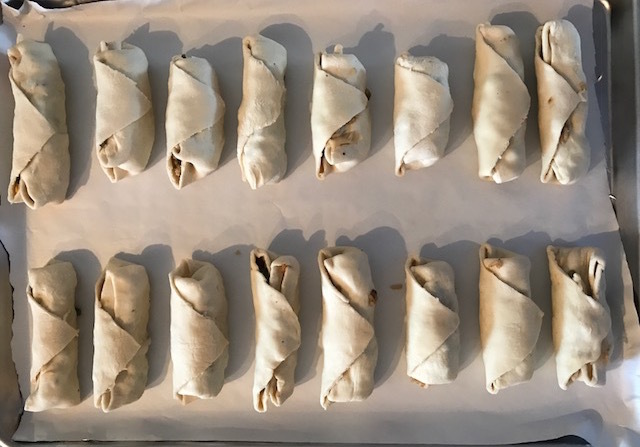 I confess that I cheated here and did not make my own pastry from scratch. Forgive me; next time I'll make that from scratch instead of buying the processed version. 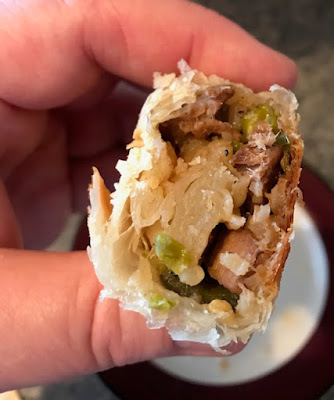 The steak and rice concoction was scooped out in small portions onto the pastry dough. 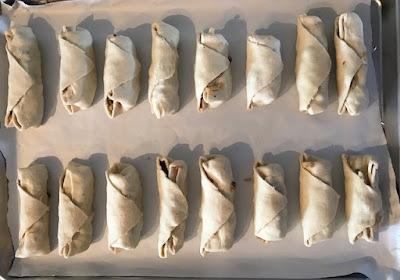 These were then rolled up and placed onto a parchment paper lined baking sheet. I next brushed a little melted butter onto each of the rolls, before putting them into a 375F oven. Well there you have it. Not sure what to call them yet, but they are a take off from another family South American favourite: Bolivian Salteñas. So here's to all those wonderful leftovers. It might just be that, the second time around, they're even more interesting than the original dish. Many of us have pet words we use to describe our loved ones. They're often sweet terms of endearment; nicknames of sorts, personal, affectionate, often a little mushy, maybe descriptive, and sometimes quite private. And who doesn't love their mom?! an-gle n., v. -gled, -gling. 1. the space between two lines extending in different directions from the same point or two surfaces extending from the same line. 2. the figure formed by two such lines or surfaces. 3. the difference in direction between two such lines or surfaces: The roads lie at an angle of about 45 degrees. 4. a corner. 5. Informal. point of view. 6. Informal. a means or method of obtaining an advantage, especially an unfair one: She always has an angle for getting the better of you. 7. one aspect of something; phase. -v. 1. move at an angle. 2. present (something) with a particular point of view or a prejudice; slant. an-gle v. -gled, -gling. 1. fish with a hook and line. 2. try to get something by using tricks or schemes (used with for): to angle for an invitation. An-gle n. a member of a Germanic tribe that migrated from what is now Denmark to England in the fifth century A.D.
An-gler n. 1. a person who fishes with a hook and line. 2. a person who tries to get something by using tricks an schemes. 3. any of an order (Pediculati, also called Lophiiformes) of bottom-living fishes that lure their prey within reach by means of a modified spine that projects from the head over the mouth, attracting other fish; especially, one species (Lophius piscatorius) found along the Atlantic coasts of North America and Europe. Well there you have it. I guess what she's saying is that her mom is "the space between two lines" or "the difference between two such lines." Maybe mom is "a corner" and not only has a point of view, but IS a "point of view." 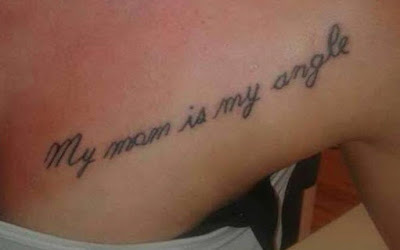 Perhaps mom likes fishing and the tattoo artist simply forgot to add the "R" to "angle" … Mom's an angler??? It could be that what she was trying to say was that her mom has Germanic roots and she's simply showing how proud she is of her heritage. After all, those ancestry sites seem to be all the rage for many these days. No, I'm being facetious, of course! It's likely a safe bet that either she or her tattoo artist (or both) simply suffer from an all too common ailment today, and that is the inability to spell. I'll bet that what she wanted to say was "My mom is my angel." That does sound better than "angle." Spelling mistakes happen. It's one thing to accidentally spell something wrong. Perhaps you even discovered a typo or two here in this post. Could happen. However, here they can still easily be corrected and no one would be the wiser. A tattoo, however, has a little more permanence attached to it. Yes, it too can also be corrected, but it begs the question as to why one wouldn't enlist some assistance with proof reading before visiting the tattoo studio. I'm reminded of a story I once heard about a man who had some oriental letters tattooed on his body. He couldn't read them but was told that they meant peace, hope and joy. That all sounded blissful and cool enough, until one day the man met a woman who could read the letters. The woman asked the man, "Why do you have 'number four beef and broccoli' tattooed on your arm?" Well there you have it. Spellchecking and editors are always a good thing. So is learning the English language beyond a Grade Three level. For further related reading, you may also want to see: Do We Need A Little Grammar Workshop? Caveat: I know, I've assumed this person's gender, a sometimes dangerous thing to do in today's world. If I got it wrong, please know that no offence was intended. Definition: The "angle" definition taken from the Gage Canadian Dictionary. I knew it! I just knew it! I always thought there must be a correlation between vegetarianism and demonic possession, and now here's the proof. Ha, Ha. I don't know where this originated from; I saw it on Facebook and had to laugh. 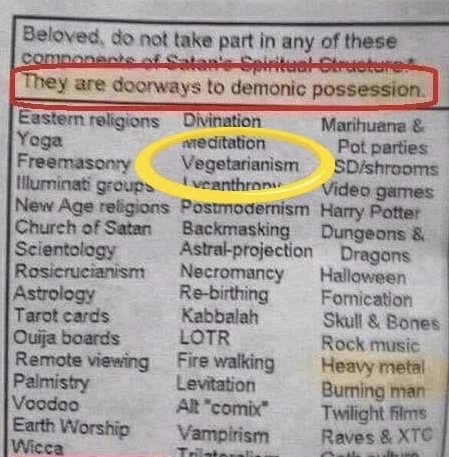 Vegetarianism on a "doorways to demonic possession" list??? Ha, Ha. But seriously, I don't even know what half this stuff on this list is. Video games and rock music are also of the devil like the meat abstainers? Well, maybe Meat Loaf's "Bat out of Hell" is (I'm being facetious. Sorry Mr. Aday), but all rock music? That's a blow below the belt! I guess I'm doomed too! Postmodernism? Harry Potter? (Don't tell my son). Really? And besides, how can one take a list like this seriously when even marijuana is misspelled? LOL. So with all due respect to my vegetarian friends, sorry for poking a little fun at your expense. I meant no harm. I'm pretty sure that vegetarianism has nothing to do with the devil or possession by his cronies. We all know, after all, that the word "vegetarian" is nothing more than an ancient word that originally meant "poor hunter." So to all you poor hunters out there, if you'll excuse me; this carnivore has to go and check on the ribs, wings and brisket in the old smoker. There will be some good eating at the pit tonight, Martha. Peace. Well today we returned to Foodie Paradise and experimented with yet another spin on an old family favourite: Rouladen. Cut steak into suitable sizes. 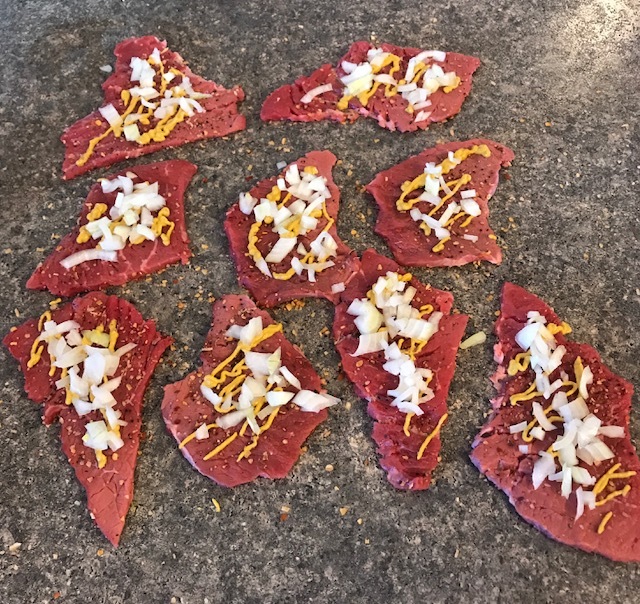 Season on both sides with Keg steak spice or other favourite. 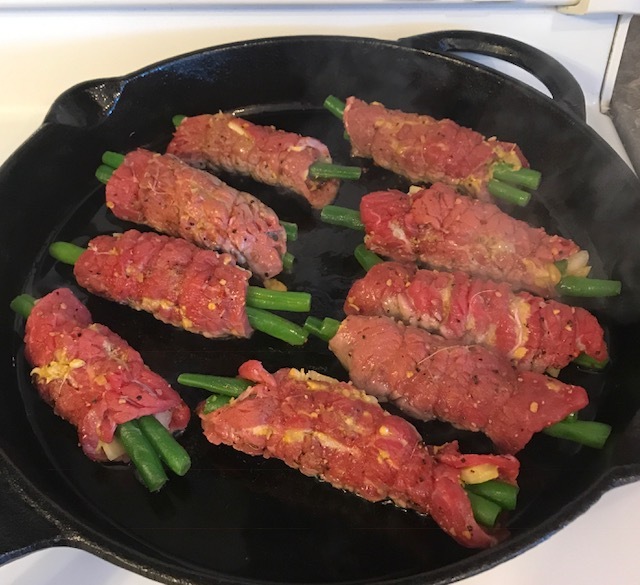 Generously squirt some jalapeño yellow mustard on the seasoned meat. 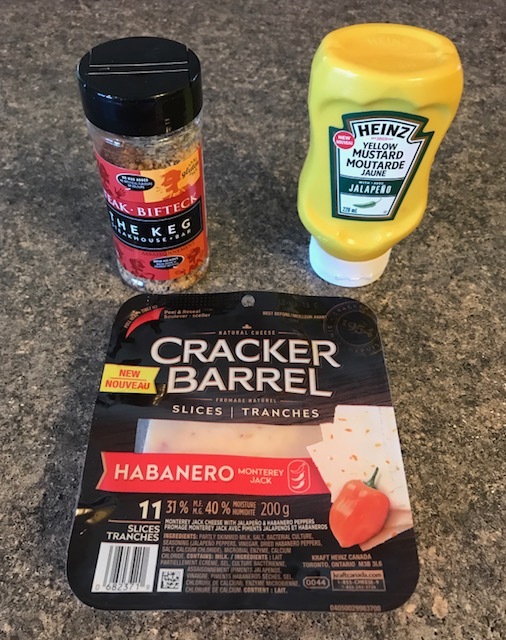 (Regular mustard works fine too, but I prefer the flavour of the jalapeño variety). Next comes a layer of chopped onions. Finally, it's time for the Habanero Monterey Jack cheese. Cheese is one of the most loved and consumed foods around the world. The word 'cheese' comes from the Latin word 'caseus' which means 'to ferment' or 'to sour.' Cheese is made from the milk of the cow, buffalo, goat, sheep, horse and camel. According to archeologists cheese was already being made from the milk of cows and goats before 6000 B.C. in Mesopotamia. Well now we come to the finicky part; the insertion and rolling of the green beans. 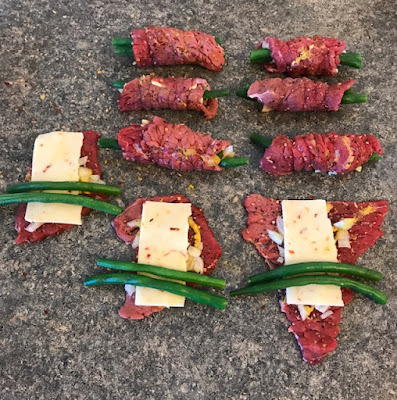 Before we came to this part, however, I took several green beans (apparently not enough, since I would have liked a little more in each roll), cut off the ends, and slightly steamed them. 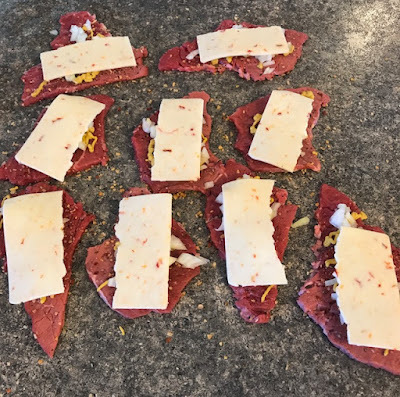 By doing this they were already half cooked before meeting the rest of the concoction. To hold the rolls together, I've experimented with two methods. One, is my Mom's method of tying thread around them during the cooking process. This works well to give you nice tight rolls, as I did here. However, I tend to be a little lazy and find the removal of the thread afterwards a bit of a pain. 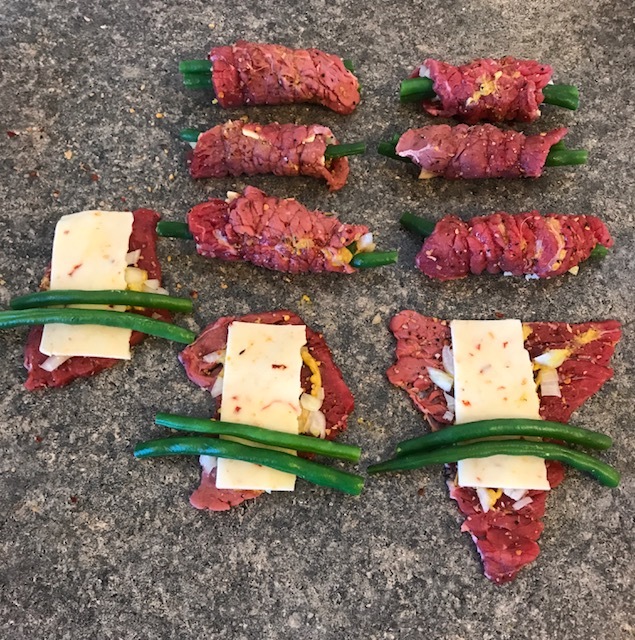 The second method I've used to hold the meat together is toothpicks. This makes for an quick easy removal prior to serving, but it tends not to form as tight of rolls. After heating up my trusty old cast iron pan with a little Canola Oil, I browned my meat rolls, turning them regularly. 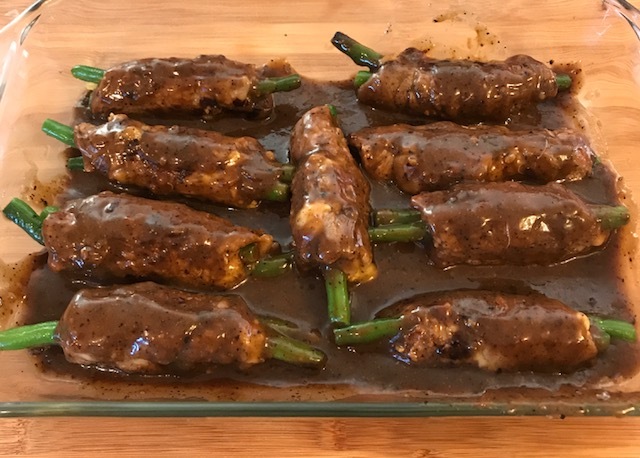 After they were nicely browned, I transferred them into an oven-friendly glass Pyrex dish to finish cooking in the oven. Before hitting the oven, however, I made a roux in the cast iron pan from which I then made some nice beef gravy to pour over my meat rolls. I covered the dish with aluminum foil and finished off in the oven. I think I may have found my new tattoo design, thanks to my grandson. Pretty cool, huh? Apparently artists run in the family. Still, this eleven month old's first artwork will be treasured, at least by his Opa and Nana. 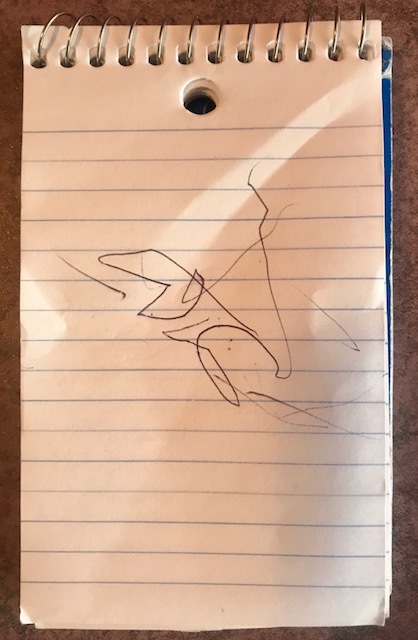 Not only is it now immortalized digitally on this blog, but the original has already been proudly posted on our refrigerator door, as all childhood artist rite's of passage seem to have historically dictated. May have to invest in some more fridge magnets soon, however. Still, that's a great problem to have. Bring them on, dear boy; Opa is ready. So eat your hearts out Picasso, da Vinci, Rembrandt, Michelangelo and van Gogh; in this proud Opa's opinion, you're about to meet some stiff competition. And watch out too, Daddy; though you obviously have artistic skills, your son (and my grandson), has discovered pen and paper! 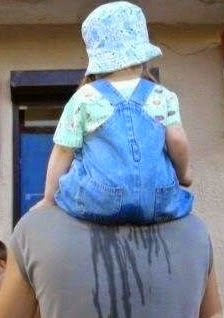 We know what that means, don't we Dad? Maybe we should start a bursary fund for art school. Hmm.